In 1977 on the occasion of the 100th anniversary of the liberation of Pleven, on the very place of the former battlefield in Skobelev Park – museum the panorama “The Epopee of Pleven -1877” was built. It was designed by Plamena Tsacheva and Ivo Petrov and a group of designers. The construction of that monument began on 19th January 1977. The inauguration was on 10th December 1977 on the very day of the 100th anniversary of the liberation of Pleven. Nickolay V.Ovechkin /Military Studio “M.Grekov” – Moscow, Russia/ was the author of the artistic part, 13 Russian and Bulgarian artists (V.Sherbakov, I.Kabanov, A.Chernishov, M.Annaniev, N.Ovechkin, D.Donchev, V.Essaulov, V.Lemeshev, Hr.Boyagiev, G.Essaulov, V.Tautiev, Y.Ussipenko, A.Trotsenko) painted the canvas under the guidance of Ovechkin. The building was shaped as a frustum of a cone, supported by four stylized bayonets. Three horizontal rings symbolize the three storms at Pleven. The ring with the bayonets stands for the blockade of the town. The building is 47 m high, with total measurement of 54 000 cubic metrеs. Panorama “The Epopee of Pleven -1877” consists of four halls – Introductory Hall, the Panorama, the Diorama and Final Hall. The canvas (115-15m) was made of linen with only one connecting vertical seam. The diameter is 40 m. The whole area together with the foreground is 2375 sq. m. The depicted prospect is about 8-10 km. The Panorama depicts the most powerful and bloody battle for the town of Pleven – the third storm (11th – 12th September 1877). Visitors find themselves in the centre of the battlefield, on the highest hill near the town, at the Turkish lines between the redoubts “Kovanluck” and “Issa Agha”. The town and the surrounding hills are visible from that place; you can see the attacking Russian and Romanian regiments, the defending Turkish troops; the Russian headquarters and Osman Pasha’s staff. On that day Russians and Romanians attacked the town from the east, south-east and south. An event of the first priority was the battle in the south where General M.D.Skobelev and his solders took part. The drama of the situation and the pressure of the battle on the Green hills are depicted by means of art. That is the battle of the Russian warriors attacking the Turkish fortifications “Kovanluck” and “Issa Agha” under the enemy’s heavy fire. You can see the culmination when General Skobelev, famous not only for his military talent, but also for his courage, having tried all possible means he personally led his detachment to battle. After a short hand-to-hand fighting “Kovanluck” was taken. An hour later the other fortification “Issa Agha” was taken, too. For the first time the Turkish defense lines were broken in depth and the door to Pleven was opened. For 30 hours, without any rest or help, Skobelev’s warriors drove back the Turkish soldiers five times. On the other two positions of the frontline the storm was unsuccessful and the Russian army retreated on 11th September. The only soldiers that went on fighting were from Skobelev’s detachment. They fought against two thirds of Osman Pasha’s army. The Russian commanders considered that the storm was unsuccessful and refused any reinforcement. The last defenders of the Green hills did their military duty and left the bloody heights at 5 o’clock p.m. on 12th September by order of the Russian commanders–in–chief. You can see Russian doctors, nurses and hospital attendants fulfilling their humane duties on the battlefield. The local Bulgarian people also helped the Russian soldiers in every possible way. Although the Russian and Romanian soldiers gave evidence of courage, bravery and strength, the third storm was unsuccessful. There was a great loss of life. 6500 people from General Skobelev’s detachment were killed or wounded, that is why the valley in front of the Turkish fortifications, soaked with their blood, was named “The Valley of the Dead”. A total of 3000 Romanian and about 13 000 Russian soldiers were killed or wounded. The repeated failure and the numerous casualties made the Russians change the tactics. A three months’ blockade of Pleven under the command of General Totleben began. The Turkish soldiers were physically exhausted. Feeling uncertainty and fear, the Turkish army had to make a fateful choice. The canvas (17-5 m) depicts the last battle for Pleven by the river Vit on 10th December 1877. The surface together with the foreground is 150 sq.m. On the 28th November/10th December 1877 after 3 months of isolation Osman Pasha tried to break through the blockade on his way to Sofia. After a bloody battle by the river Vit, the corps of General Ganetsky defeated and captured 43 000 – Turkish army. Marshal Osman Pasha, one of the most talented Turkish commanders, was defeated. 10 pashas, 128 staff officers, 77 heavy guns and a lot of banners were taken prisoners. 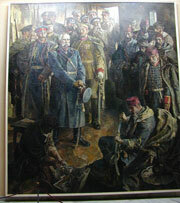 Two paintings (4 x 3.60 m) depict the surrender of Osman Pasha and the Russian army crossing the Balkan range in winter. The liberation of Pleven is a turning point in the course of the war. Having surmounted the most difficult obstacle on its way, the Russian army had to cross the Balkan range in winter – a military operation thought by the specialists to be impossible. Only a month and a half later the Turkish government asked for peace. On 19th February (3rd March) 1878 the peace treaty between Russia and Turkey was signed in San Stefano, under which Bulgaria restored its state system. There are also military uniforms, weapons and artillery belongings from the Russo-Turkish war displayed in the final hall. The permanent exhibition of original lithographs from the end of the 19th century arranged in the rotunda of the Panorama “The Epopee of Pleven-1877” represents moments from the Russo-Turkish war as well as episodes of the struggle for national liberation of the Bulgarian people during the national revival. Very important among them are the battles of Hadgy Dimitar and Stefan Karadga’s bands, Pleven Epopee and the way the people in liberated Bulgaria, Europe and Russia reacted to those events. Made during or immediately after the events they depict, the lithographs are historically authentic. You can see here works of art made by famous Bulgarian, Russian and Romanian artists: icons made by G.Danchov, a sculpture of general M.D.Skobelev made by A.Spassov, busts of military men – participants in the Russo-Turkish war 1877-1878, made by P.Trubetskoy and F.Shtork; black-and-white drawings by Sidonia Attanasova, which depict the Epopee. There are also interesting projects from the competition for building the chapel-mausoleum “St.George Victor” in Pleven (1903).